Our product range includes a wide range of dental amniotic membrane. Being a quality oriented organization, we are able to offer a premium quality Dental Amniotic Membrane. This amniotic membrane is used to facilitate the growth of new cells and tissue which is lost by gum disease. 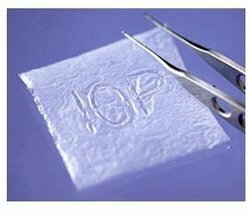 Also, we provide this amniotic membrane in numerous sizes and other customized options to fulfill the requirements of customers. The offered amniotic membrane is checked by quality controllers so as to deliver a defect free range from our end. Looking for Amniotic Membranes ?